Dogs panicking when their owners leave is a big problem, these days! And, no one wants to be held hostage by their dog. I talked to a puppy training client who NEVER left his puppy alone. If you ask me, he is the more prominent part of the problem and has created separation anxiety in his puppy. Fostering independence and allowing your dog to be alone is imperative. Just like you want to raise an independent child, you also want to raise an independent dog! There Are Tricks To Help Keep Your Dog From Panicking When You Leave. 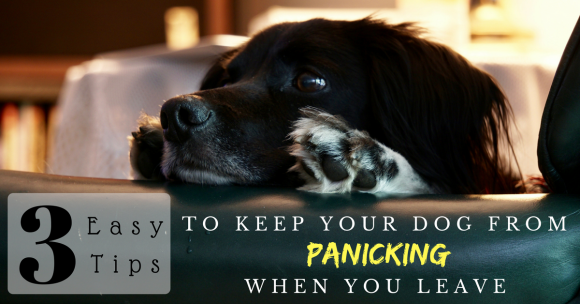 So, what can you do if your dog begins to panic when you leave? Follow these simple steps to help ease your dog’s pain. Very few of us live in an environment that is totally sound sterile. We have the TV on or the radio. We talk amongst ourselves; kids run around screaming and playing. But when we leave, we tend to turn all of our devices off and leave our dogs totally alone. Instead, turn up that radio and give him something to listen to other than all the scary noises outside. We all have a routine of getting ready to leave before we actually leave. We find our purse, our keys, our shoes, and proceed to prepare to go. All of these things can create stress for your dog because they are precursors to your actual leaving. So, the best thing to do is desensitize your dog to these sights and sounds so that they begin to have little to no meaning. This means you should go pick up your purse and sit back down on the couch. Get your keys and carry them around with you. Put your shoes on and wear them in the house or take them off again. By doing these things often, without leaving, it eventually takes some stress away from your dog. The dog will never really know when you are leaving. Exercise is crucial to good health, not only for you but also for your dog. Exercise will also help him relax when you do leave. Imagine sleeping all night, going outside in the morning and then being left for the day. It seems like many dogs “panic” because they are bored and don’t know what to do. So many of them trash the house and eat things that they shouldn’t because these things at least bring some mental stimulation and physical stimulation into their lives. If it seems like your dog panics when you leave, do him the favor of providing him with some real exercise before your leaving. I like to have my dogs run beside my lateral recumbent trike; it provides them with a large amount of physical exercise fairly quickly. I cannot walk far enough or run fast enough to tire my dogs, but I can let them pull me and my trike around the neighborhood for a half hour or an hour. Then, when I leave, I know he will take a nap instead of eating my sofa. Plus, exercise is good for the mind! Have you ever been super frustrated with someone or something and gone for a run or lifted weights at the gym? Physical exercise calms the mind and fills the brain with feel-good serotonin. You don’t have to put him on medication, just help him get that feeling through exercise! Get up early, stay up late, and make some time to ensure that your dog is getting physical exercise and some good mental stimulation through training and you will see him relax and take your leaving in stride. Do You Want To Learn How To Fix Your Dog’s Fears? Click here to learn this ‘Becoming Fear Free’ training process.